Hey everyone! I'm back with another super duper easy recipe that you can do in a jiffy! For parents out there, your kids can also help you prepare this super easy and tasty meal. This recipe is also suitable for vegetarians. 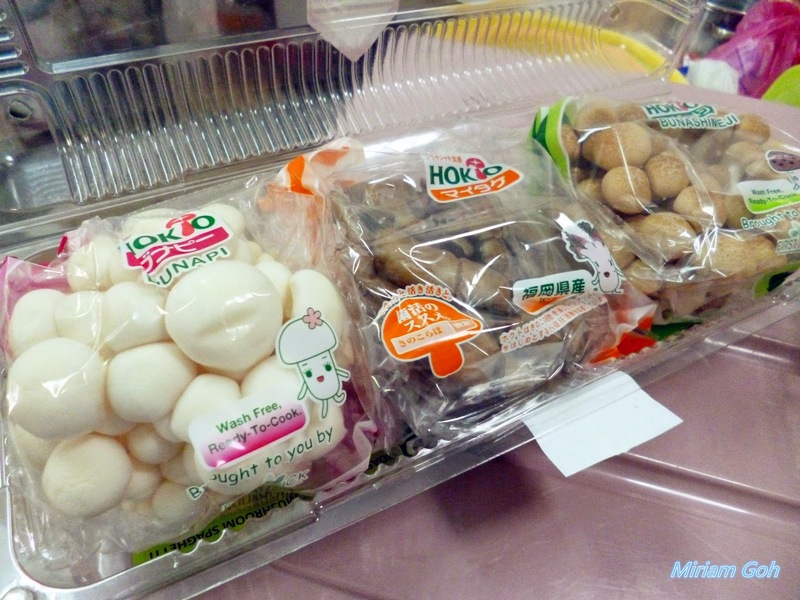 Anyway, let me introduce the mushrooms to all of you :) I bought my mushrooms in packs of three which means I get three different varieties of mushroom to try out! Firstly, meet the Japanese Brown Beech Mushroom. 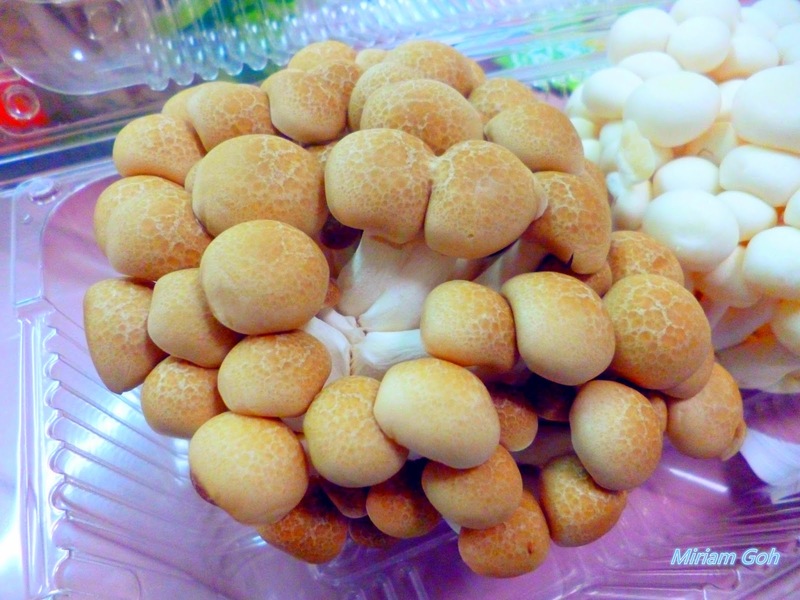 Shimeji Mushroom is the thrid most popular mushroom in Japan, after shitake and enoki. They are also known as beech mushroom because they often grow on fallen beech trees. These mushroom have a white base and speckled brown caps which are so pretty. Reminds me of a giraffe. They don't have a strong aroma but once cooked they have a smooth and crunchy texture. They also have a buttery and nutty taste. 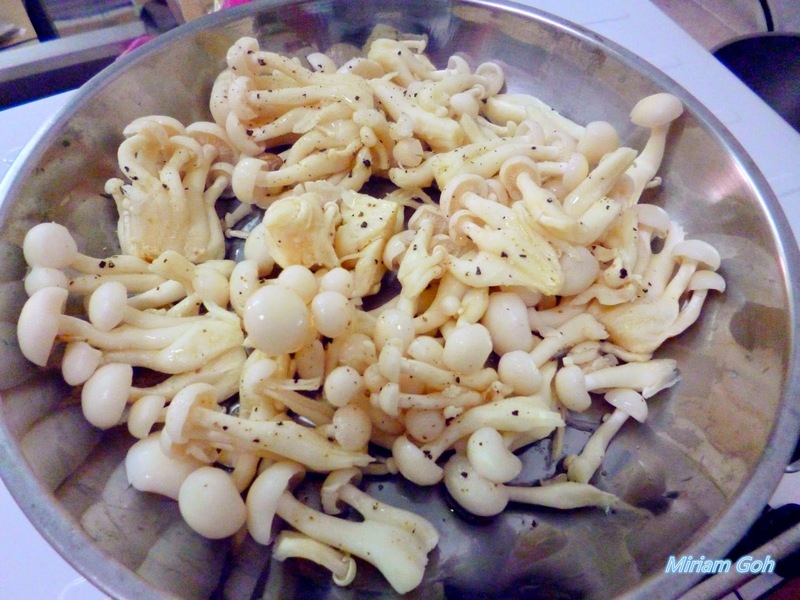 Please remember, you have to cook these mushroom before eating! The Brown Beech is not only flavourful but also very healthy. It provides a significant source of niacin and is a good source of protein, fiber and antioxidants. This mushroom is also cholesterol-free, low in calories and a tasty meat substitute. So to all those out there who are vegetarians or are dieting, this is a great ingredient to consume! 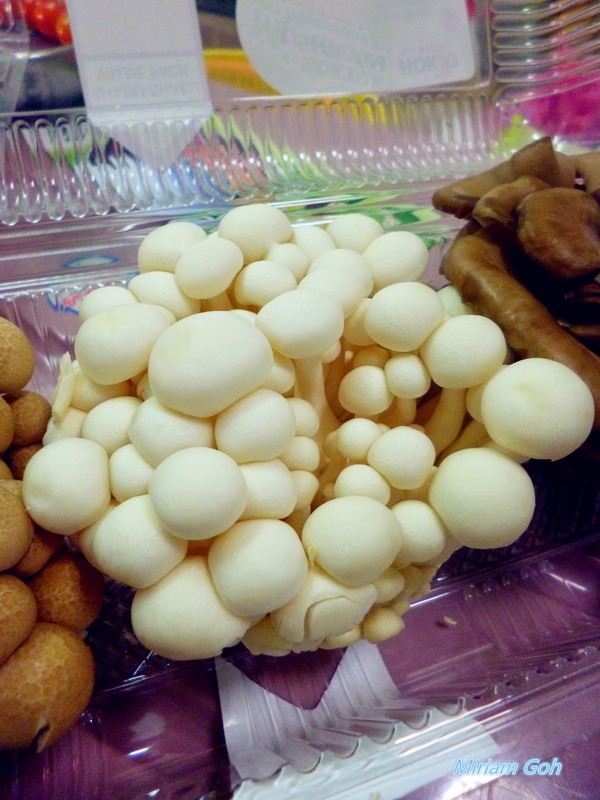 The next mushroom is the Japanese Bunapi Shimeji Mushroom. It is similar with the brown beech mushroom and only differs in the colour of the mushroom. The firmness of the mushroom stands up well to savory herbs like thyme and hearty dishes like stir-fries and wild game. If eaten raw, it is somewhat bitter but becomes very enjoyable once cooked. You can try this in soups, stews and in your favourite sauce. You just need to cut off the base and enjoy them. The last variety is the Maitake mushroom. 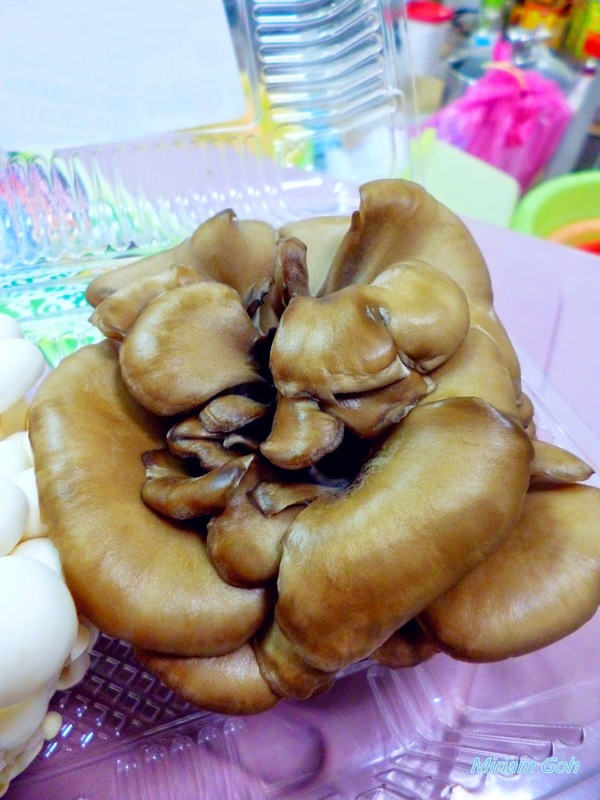 This mushroom has a firm texture and robust, earthy flavour and is sometimes referred to as "Hen of the Woods". In Japanese, Maitake means "dancing﻿ mushroom" because some belived that in the ancient days, people would dance for joy upon finding these mushrooms which were worth their weight in silver while somoe says it is because of the mushroom shape which resembles a dancing nymph. The Maitake mushroom has long been used in Asian medicine to enhance the immune systems and is known for its cancer-fighting properties and contains grifolan, an important beta-glucan polysaccharide. It is also rich in potassium, vitamin B2, D, niacin, fiber and amino acids. Maitake mushroom is also cholesterol-free and contributes protein and umami, a taste that provides a unique, savory flavor which makes Maitake mushroom a good meat substitute. So enough of all the important information about mushroom. 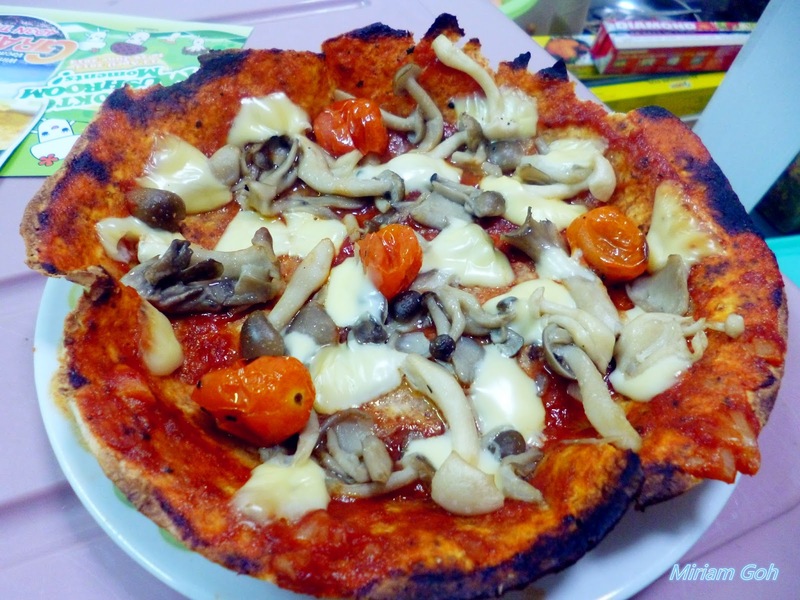 Let's get on to the recipe which is Mushroom Pizza. To prepare the mushroom, you just need to cut the base of in a triangular angle. This way you won't waste and discard the mushroom parts that can be used. 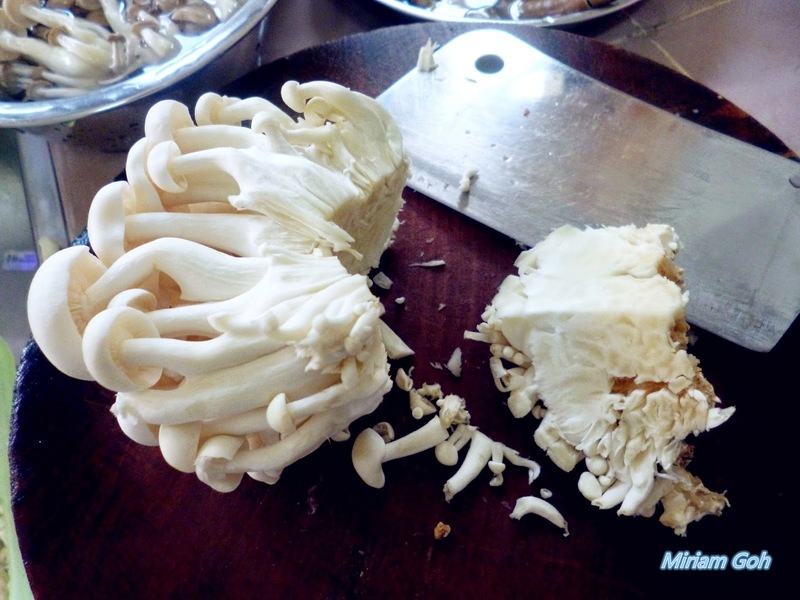 Most people cut the base off using the wrong method and waste their mushroom. Next, place your mushroom on a baking tray or dish and season your mushroom with some freshly grinded black pepper and salt. Add some olive oil to give it a nice shine and added flavour. Besides that, I also placed some cherry tomatoes to roast as well to add on my pizza! 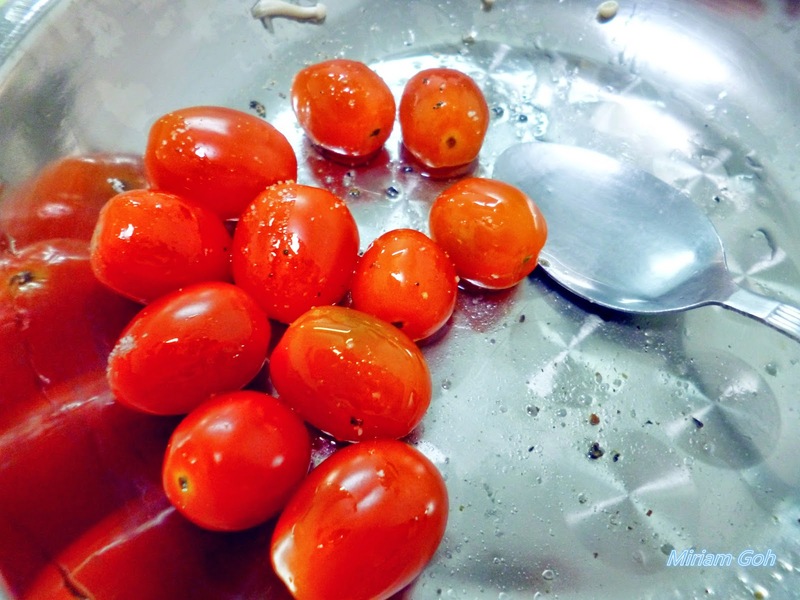 Love grilled or roasted cherry tomato. I can't really stand the taste of raw cherry tomato but after roasting them, I love the taste of the cherry tomato bursting in my mouth! Take a tortilla wrap (I used wholemeal tortilla wrap), spread some tomato paste on it *I will be sharing my homemade tomato paste recipe* and arrange your tomatoes and mushroom on it. Place some cheese slices and put it back in your oven to bake for another 2 minutes just to melt the cheese and give your tortilla some crispy bits. Please don't be like me and forget about the tortilla pizza in the oven. I had some burnt sides because I was concentrating in cooking my mushroom soup. And there you have it, a healthy version of Mushroom Pizza. To reduce the calories, you can skip the slices of cheese or add cottage cheese which has a lower fat content! Step 1: You can choose to either grill your mushrooms with a dash of salt and pepper of just do it on the stove top. Add some olive oil in a saucepan and saute 2 cloves of garlic and your mushrooms. I used all three varieties of the mushroom because I love how they all taste together. The Maitake mushroom will give most of the flavour in the soup! Add a dash of salt and pepper while saute-ing your mushrooms. Step 2: Wait until the mushroom slightly wilt and add your vegetable stock of chicken stock. The amount of stock depends on how thick you want your mushroom soup. Adding more stock will give you a dilute mushroom soup while adding lesser stock will give you a strong flavoured mushroom soup. Step 4: After blending your mushroom mixture until your preferred consistency, pour back the pureed mushroom mixture into your saucepan and turn on the stove. Cook it until it starts bubbling and now you can add your cream to thicken your mushroom soup and give it a creamier taste. If you want a healthier version of this soup, skip the cream and add some milk with corn starch. The corn starch will help thicken your soup. Don't worry, a tablespoon of corn starch is only less than 100 calories :) Remember to dissolve the corn starch in a little bit of the soup before pouring it in. Step 5: The corn starch will continue to thicken the mushroom soup as it keeps cooking so don't worry if after you add your mushroom soup it still does not thicken. Taste your mushroom soup and add salt and pepper to your preference.